So, kale chips. I know they've been done many times before and there are many variations. Well, with my Hungarian roots, paprika came into play with my version. 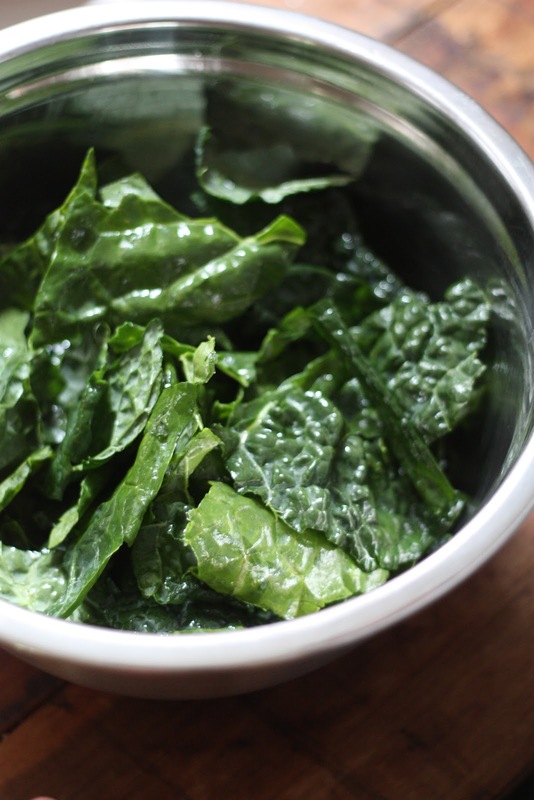 There are many greens coming in our Farm Table box nowadays and as you have seen from past posts like mustard greens, Swiss chard, and even burgers — we are looking for creative and fun ways to use these nutritious greens up! 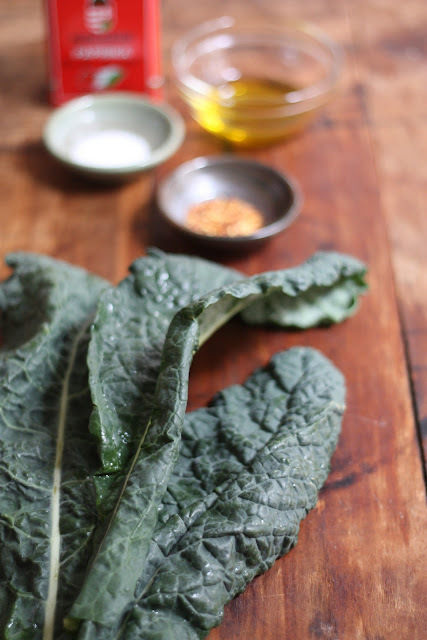 First, the star of the show: Tuscan kale — a hardy leaf with a deep rich green color and just the right texture to tear for baking into chips. Set oven to bake at 350 degrees. Wash and dry kale thoroughly. Cut the middle rib or stem out of the leaf and tear remaining leaves into desired chip size pieces. 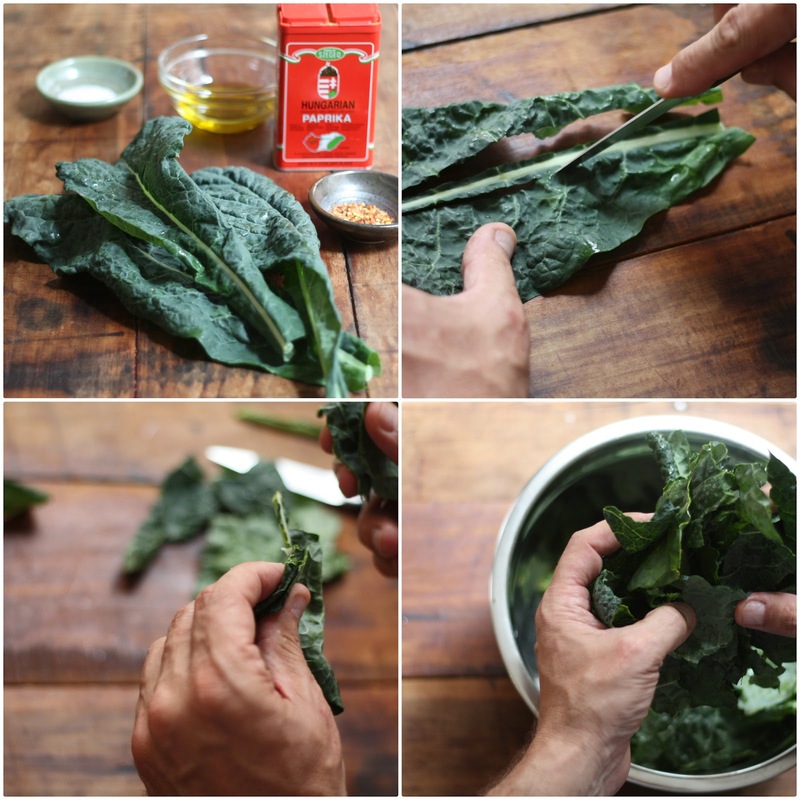 Start with 1 tablespoon of olive oil and toss the kale with your hands thoroughly coating the oil onto all of the pieces. This should be enough oil as too much oil will make the chips soggy. You want them lightly coated like I tried to show above. Continue by adding desired salt and crushed red pepper, tossing to coat. 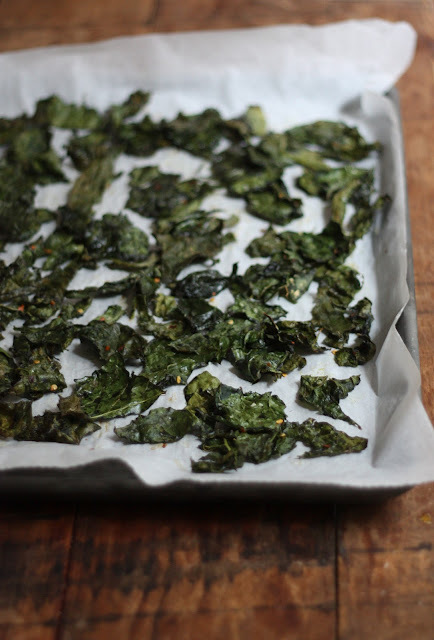 Spread kale on a cookie sheet with parchment paper in a single layer and place in the oven. 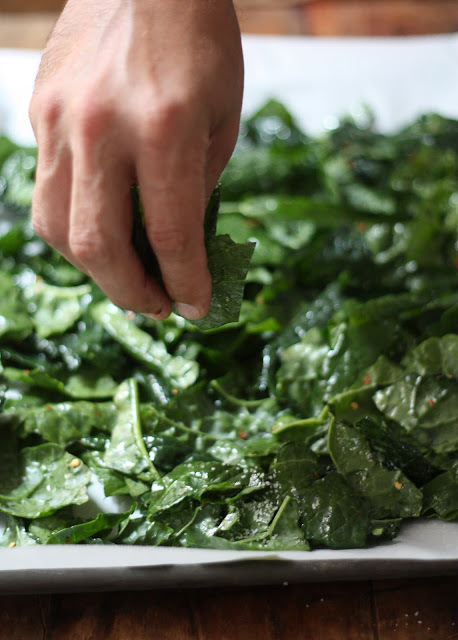 At the 15 minute mark check your kale, rotating the pan or even starting to toss the chips. Keep a close eye on them at this point and remove from the oven once they have become dry as not to burn. You chips should look similar to the above after about 20 minutes (ovens will vary, so keep an eye on them). While they are still warm, dust the chips with Hungarian paprika and toss in a bowl to enjoy, adding salt as you see fit. This is really a fun, healthy, and flavor packed way to enjoy all of the seasonal kale we are now seeing. 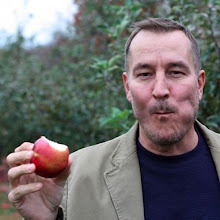 I'd love to hear your version of this tasty and nutritious treat! I'm hearing rumors of beets possibly coming in next week's box and am so looking forward to those! Hi Chriesi very nice to meet you here. Hope you will continue to stay in touch. Happy eating! Well Ozlem I am so glad you find my site! Of course you can use your own Turkish spices (I won't tell my grandmother). Thanks again for stopping by and I hope you will become a regular visitor!